This is a display called "Cool Globes." 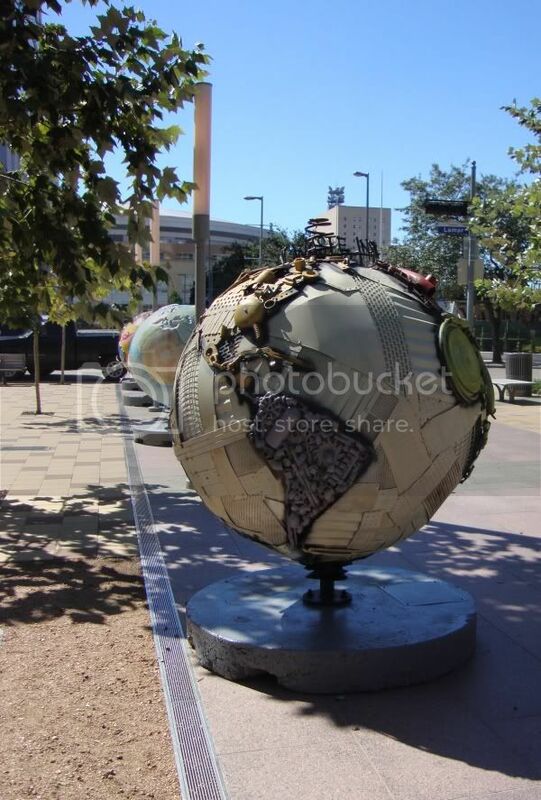 The globe in the foreground is "One Man's Trash...Don't Waste--Instead Create!" [sic] by Mitch Levin. This globe looks really cool. 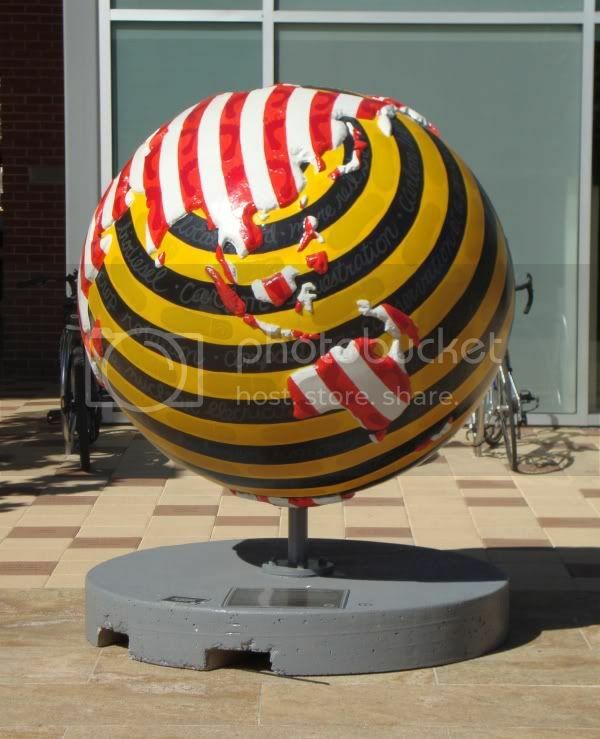 The two sets of stripes going in angles to each other are strong graphicly, especially as the stripes wrap around the spherical surface. But when you walk up to it and read the title, you kind of deflate. This Archimboldo pastiche is a completely charming piece that manages to avoid coming off as a lecture (at least until you read the fine print on the plaque). I don't know if there is a "right" way to do political art. Art in general reaches such small audiences, the idea of using art as to change peoples' minds is usually a futile and vainglorious enterprise. 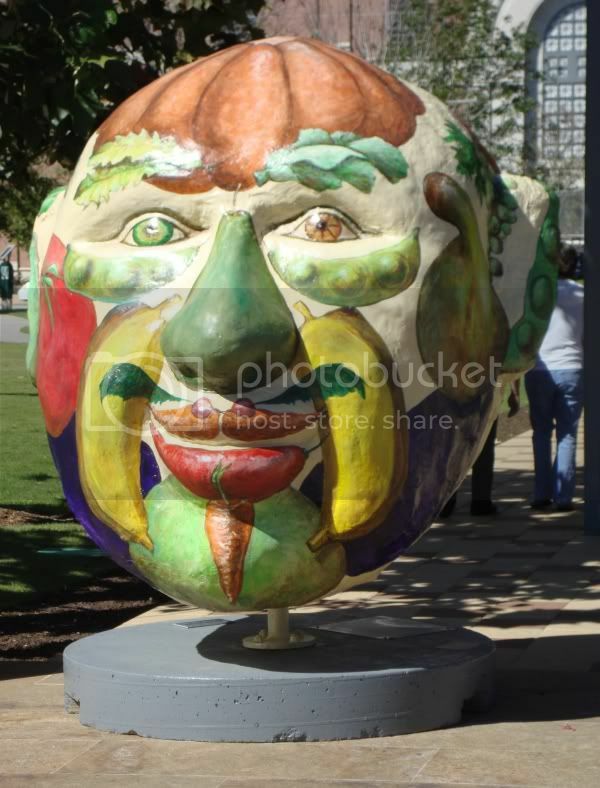 On the other hand, Cool Globes as it tours the world will be seen by hundreds of thousands of people. Some of these globes look really cool--but often the beautiful or the visually striking are separate from the message. For example, look at many of the striking posters and graphics from the Soviet Union, Nazi Germany, Red China, Communist Cuba--they often look absolutely fantastic! Obviously I am not suggesting that Cool Globes is anything like those regimes, but by this time in my life, I tend to separate visual interest (or beauty) from meaning (particularly political meaning). Maybe some people can be seduced by beauty into taking a political stance. I'm pretty sure I can't. In any case, I hate art that lectures at me. As benign as these pieces are, they still come across as teachers or parents telling me the "right way to live." Boy, I just don't want that from art. Your obviously missing the point to these pieces. As you stated they were on display and as art some will be better than others, aesthetically as well as expressing their message, be it political, environmental or just graphic (art for arts sake) Now like any art it is meant to be interpretive, but to call it contrite I'm not sure you understood the underlying concept to the project. 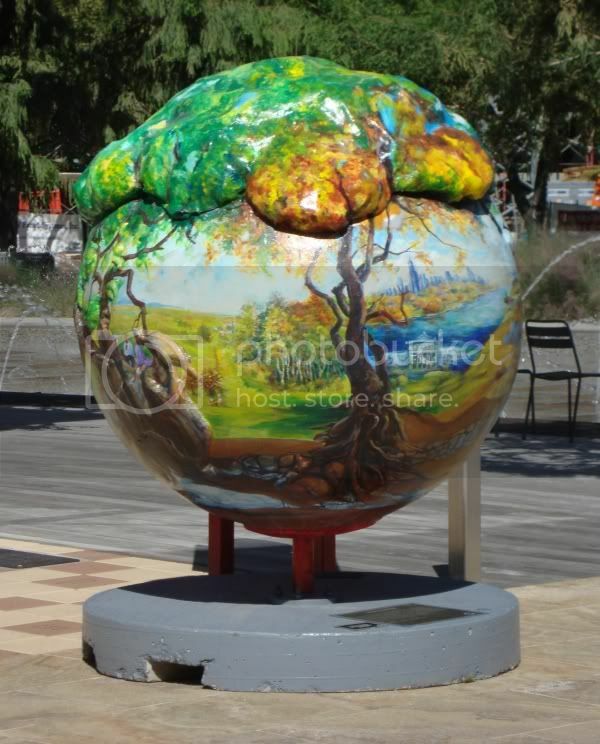 Now I was part of this project as an artist , actually did 3 globes for different cities, never told what to do other than to depict an environmental issue which was the premise of this fundraiser. Be it contrite, or lecturing you as the audience have the right to experience these walk past or even as you did, post a blog telling your opinion. Thats the beauty of freedom of speech, just wanted to let you here an actual artist view of this display. Thanks for commenting. I stand by my criticism, although I welcome any contrary views. Here is a message from your second Cool Globes Artist: Thanks so much for the coverage of my globe with my (now ex) husband... Tread Lightly. So sorry the title didn't inflate your feedback. Like the artists above, we had very little oversight in terms of our message and content. I will tell you, this was our proposal number II, as the committee thought our first proposal was too radical in terms of execution. As with all art, the creative makes the work and sends it out into the world. The creator cannot foresee the viewers response. The viewer brings their own set of baggage to any work. In the end, it is still my intent to tread lightly on this earth. Like you, I welcome any contrary views about our overall message. Peace.